Zippy meets Dr. Jane Goodall! Elise, Zippy, Mr. H. Junior and Dr. Jane Goodall. 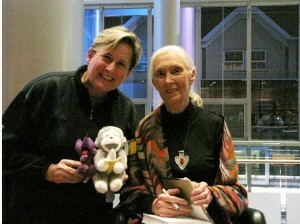 Dr. Jane Goodall was in Seattle recently to promote Roots and Shoots http://www.rootsandshoots.org. Top Dog Elise brought Zippy along to meet Jane and found out she has a plush monkey she travels with – Mr. H.
Zippy has been to the Ring of Kerry in the Southwest Coast of Ireland, the Great Wall of China, wine country of South Africa and the pyramids of Egypt. But ask where he had the most fun during all his travels and he says “That’s Easy! The slip and slide in Indiana with my fabulous nieces and nephews. These kids know how to have fun”! Woof! Does a camel say WOOF? Jill Higgens – our forever Corn Dog – sent her ZippyDog off on an adventure with friends, Terry and Jerry. 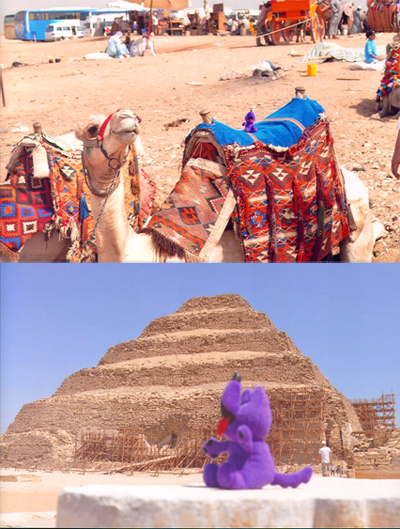 Zippy got to ride a camel, see the pyramids and so much more. Yeah, ZippyDogs printed those fine looking wine glasses you will see... if you get our newsletter. The Zip Dogs partied down in Elma WA at the annual Mark Reed Foundation fundraiser. They were networking with guests, enjoying fine wines and even sang on stage with the band. It was all going so well until someone introduced jello-shots. Then Kristin, the mean “leprechaun police” found out that they had no valid ID and escorted us off to the Elma Jail. Look folks, if you want the full story and very incriminating photos then you need to get signed up for the May Newsletter, The Fire Hydrant Times, our bi-monthly pee mail. We are emailing it out on Wednesday, May 5th! 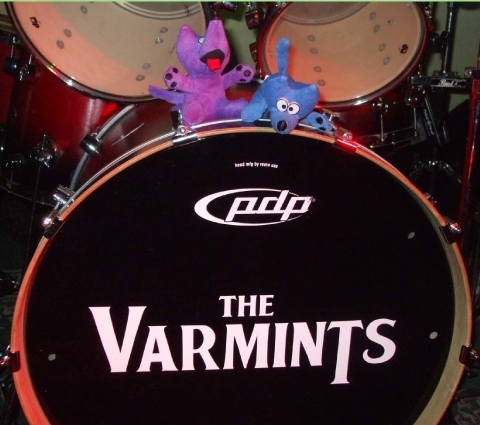 Sign up for our newsletter here – Click it or ticket! 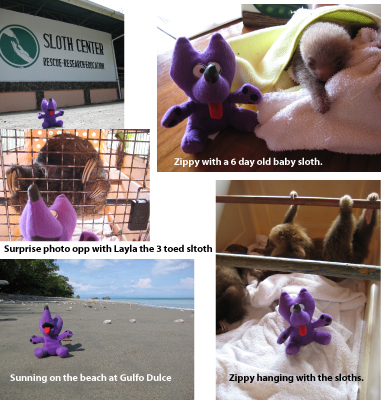 This past February, Zippy traveled to Costa Rica. He spent some time on the beach, was nearly taken to sea by a wave and met some super sweet baby sloths. Zippy left his heart with Layla at the Sloth Rescue in Cahuita on the Carribean side of Costa Rica. Filed Under: Blog, Where's Zippy?